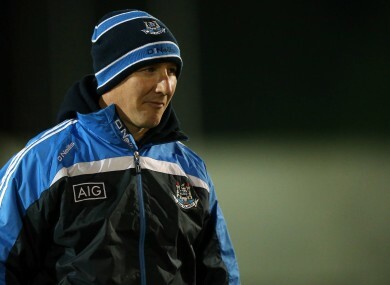 Dublin manager Jim Gavin on New Year's Eve. BOSS JIM GAVIN has poured cold water on the idea of Ciarán Kilkenny becoming a dual star with Dublin 2014. All-Ireland football medallist Kilkenny has been contacted by hurling manager Anthony Daly about playing for the Leinster champions this year. The current Dubs U-21 hurler combined a dual role at minor level in 2011 and memorably competed in both All-Ireland finals. Daly indicated that he is open to sharing the player in the coming season though Gavin appeared to rule out any accommodation, stating it was impossible to combine both at the top level. Kilkenny has yet to confirm his own plans though he did line out for the Dublin footballers in the New Year’s Eve Dubs Stars challenge in Clondalkin. “I’ve said it before, I don’t think you can (do both) at the elite level,” said Gavin. “I don’t think it can be achieved. We’ve always left it open to the players to make that decision. Asked if he was stating that it isn’t possible to combine both and that a player would have to choose between codes, Gavin nodded. “At the elite level, I don’t believe you can (do both), no,” he added. Gavin has guided Kilkenny to All-Ireland title successes at U-21 and senior level in the last two years. But the former AFL rookie, 20, has never hid his love of hurling. Kilkenny stated after September’s All-Ireland senior football final win that he still held ambitions of playing for the county hurlers. Email “'I don't think you can do both' -- Jim Gavin not keen on Ciáran Kilkenny's dual ambitions”. Feedback on “'I don't think you can do both' -- Jim Gavin not keen on Ciáran Kilkenny's dual ambitions”.